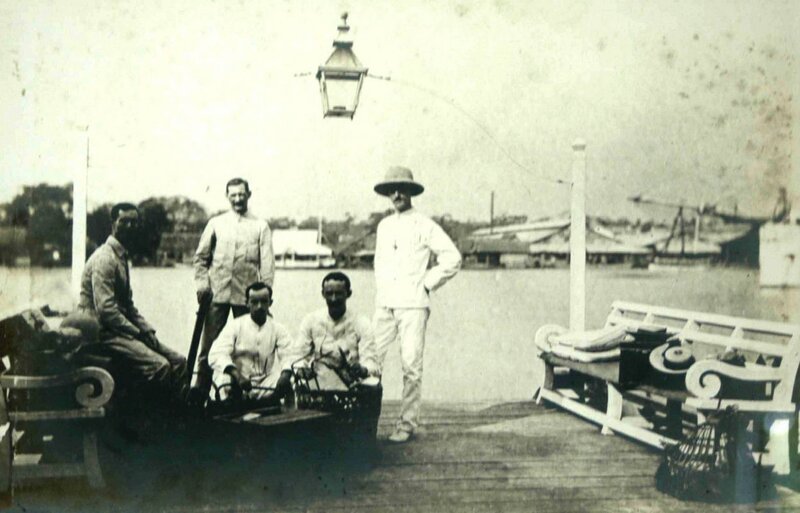 Charles Hillier, the first consul, arrived in Bangkok in 1856 and rented premises in the Bang Kholaem district of southern Bangkok. In 1857, King Mongkut gave the consulate a piece of land on the river, which was slightly enlarged soon afterwards to about seven acres. It was roughly rectangular, lying between the river at its west end and a muddy track at its east end, and with klongs (water channels) forming the two long boundaries with the Portuguese consulate to the north and temple grounds to the south. Hillier’s successor, Sir Robert Schomburgk (sic), arrived in Bangkok in December 1857. He was 53 and an experienced traveller, writer and collector, but best known for having surveyed and marked out the boundaries of British Guiana. It was fitting that the new consular site should be laid out by an experienced surveyor, rather than have buildings merely strewn about. Schomburgk’s plan was straightforward: he sited the consulate building about fifty yards back from the river bank, where he built a landing stage and boat shed as the main access to the site. In front of the consulate he put a tall flagstaff. The building itself was rectangular in plan, about ninety feet wide and seventy-five deep, with shuttered verandahs all around its two floors, sitting on sturdy stub columns to raise the main floor above flood levels. In the centre of the site he planned assistant’s and vice-consul’s houses and at the back, by the muddy track, the courthouse, constable’s quarter and gaol, and native quarters. In time, the muddy track became more road-like and began to take over from the river as the compound’s main access in the 1880s, and especially after it acquired an electric tramway in the 1890s. The main entrance to the house had then to be moved from facing the river to facing the public road. A wide straight drive was laid down the spine of the site from the entrance gates to a large turning circle in front of the house. A fine statue of a seated Queen Victoria was placed outside the entrance gates in 1905: it was a reproduction, paid for by public subscription, of the figure by Alfred Gilbert RA that was commissioned for Winchester. The compound, lushly overgrown, served well enough to the end of the nineteenth century but was by then surrounded by noise, smell, traffic and pollution of every description. The desirability of a move was first mentioned by the minister, Ralph Paget, in the early 1900s. In 1908, the Thais tentatively offered another site in exchange, and London agreed in principle that the legation should be moved if that could be done at no expense to the British government. Nothing came of these ideas before war broke out. Compound layout in 1895 (north to the left), with river and jetty at bottom and new road entrance at top. 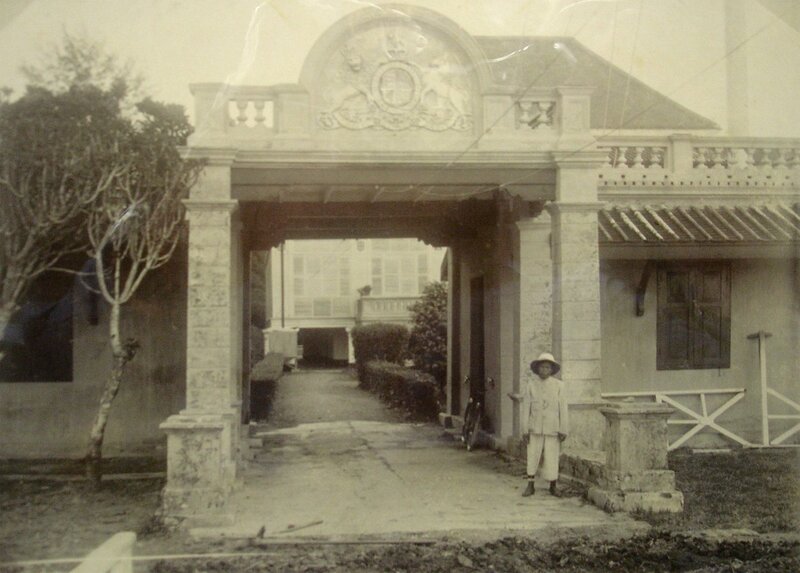 Gate lodge between jetty and residence, 1907. Residence from the river, with flagstaff stays in foreground, 1901. Road entrance to compound, with seated Queen Victoria,1900s. Compound grounds, with the assistant’s house on the left, 1900s. Residence from within the compound, with flagstaff and river beyond, late 1890s. By 1920, the pressure to move the legation away from the central site by the river had grown extremely strong: that area of the city was now much too over-crowded and polluted, and almost every other mission in Bangkok had already moved away. Cecil Simpson, an Office of Works architect, visited early in 1921 and, strongly supported by the minister, Richard Seymour, concluded that the time had come to act. 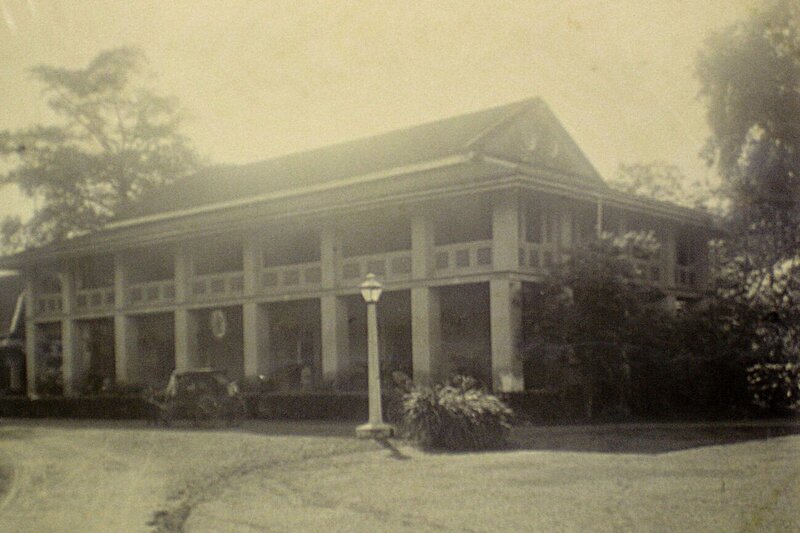 He was attracted by a site which was occupied by the Royal College of Pages but, soon after he left Bangkok, Seymour reported that Phra Pakdi Noraseth, a successful and cultivated businessman popularly known as Nai Lert, who had shown them some of the paddy fields he had drained in the Sapatoom area on the edge of town, had offered to exchange a large site there for half of the present riverside compound. The Treasury was sceptical, and firmly repeated a stipulation it made in 1908 that any move should be fully self-financing. Seymour, when earlier reminding Simpson which site Nai Lert was now offering, described it as ‘surrounded by a barbed wire fence supported, you may remember, by ridiculous projectile shaped cement monoliths. …’. The one at the south-east corner remains in position today, having mystified generations of commentators. 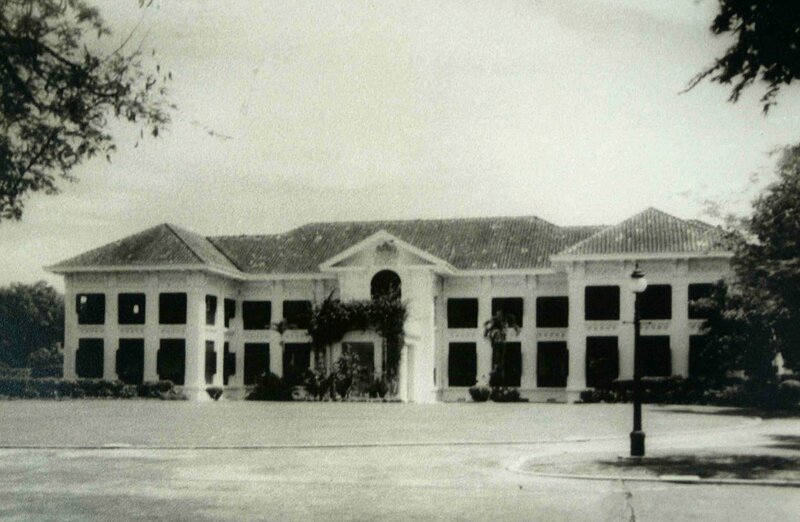 A few months and several discussions later, Nai Lert recast his offer: he would give the British government an option on about eleven acres of his site at Sapatoom free of charge in return for his being given an option, up to the end of 1923, to purchase the riverside compound (except for a small piece that the British government wanted to retain for the Consular Shipping Office) for 1.1 million ticals (£117,000). 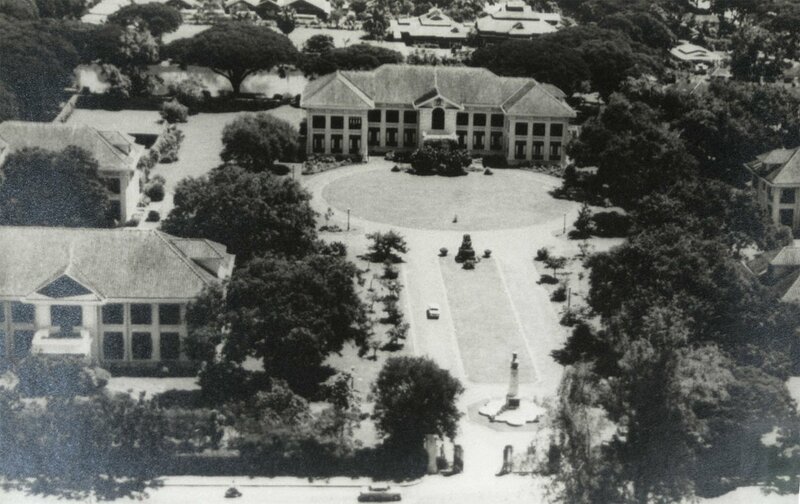 Nai Lert was also content for the statue of Queen Victoria to be removed to the new legation site, as well as the iron gates and railings, and the flagstaff. This proposal held sufficient promise of being self-financing to satisfy London. The option agreement with Nai Lert was signed in March 1922. Robert Greg, who had replaced Seymour, correctly forecast that Nai Lert would make every effort to exercise his option quickly, and he did – three months later. 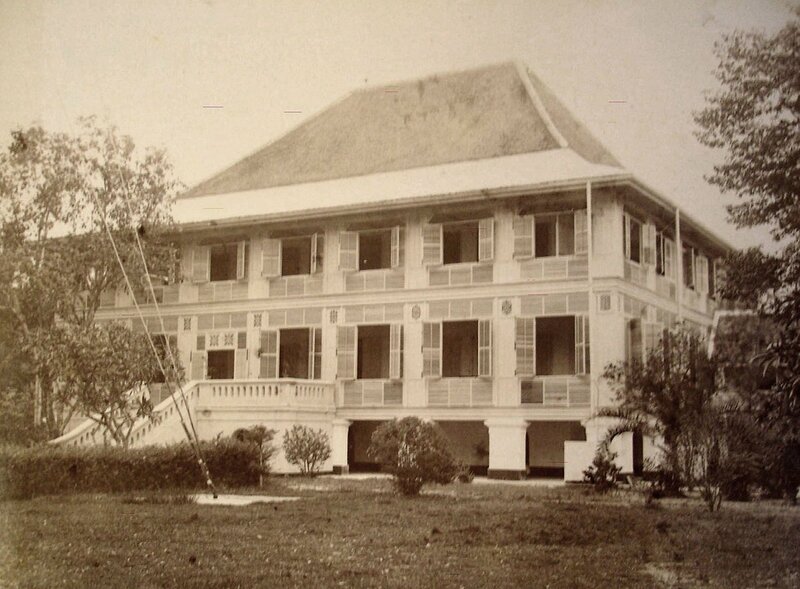 It would appear that the net effect of the transaction which Nai Lert master-minded was that the Siamese government bought back in 1922, as the site for a new Central Post Office, at least some of the site which King Mongkut had donated to the British in 1857. 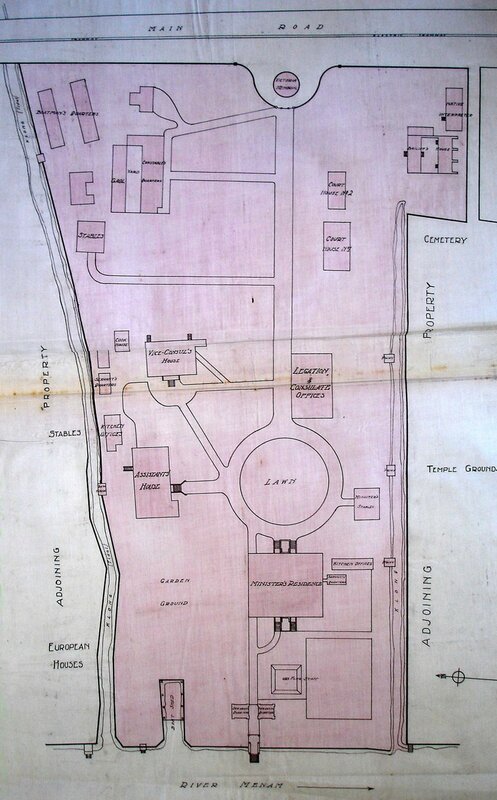 In expectation of agreement being reached, planning and design work for the new compound had earlier been put in hand. 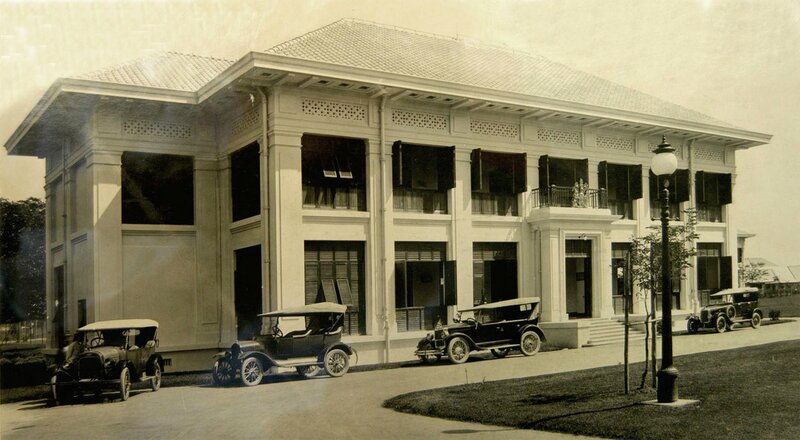 Julius Bradley, the Office of Works architect in the Shanghai office, was tasked with preparing preliminary plans and arrived in Bangkok with them in June 1922. Greg was far from impressed and asked W.A.R. Wood, the consul-general at Chieng Mai, to discuss improvements with the Office of Works during his forthcoming leave in London. An Office of Works architect in London, Archibald Scott, accordingly took over the design work from Bradley and was shortly afterwards posted to Bangkok as resident architect, charged with tailoring the designs to local conditions, incorporating Greg’s preferences where acceptable, and overseeing construction contracts. The new compound was close to square in plan, each side about 200 metres long, with klongs (water channels) along three sides and, to the north, a large rectangular drainage pond that Nai Lert had dug as a cistern to cope with the heavy rains. Bradley’s layout proposal for the new compound reflected the overall disposition of Schomburgk’s at the former compound. The axis was a wide, straight ceremonial route northwards from the main gates in the centre of the south frontage to a circular drive in front of the minister’s residence, with two other buildings on each side for offices, consul-general’s and vice-consul’s houses, and students’ quarters. Each of these five main buildings was of two storeys, with verandas round each floor. The first structure to be actually erected was a granite War Memorial, designed by the Aberdonian sculptor Sir James Taggart, and commissioned by a trust formed for the purpose in 1919: it was dedicated on 10 October 1922. 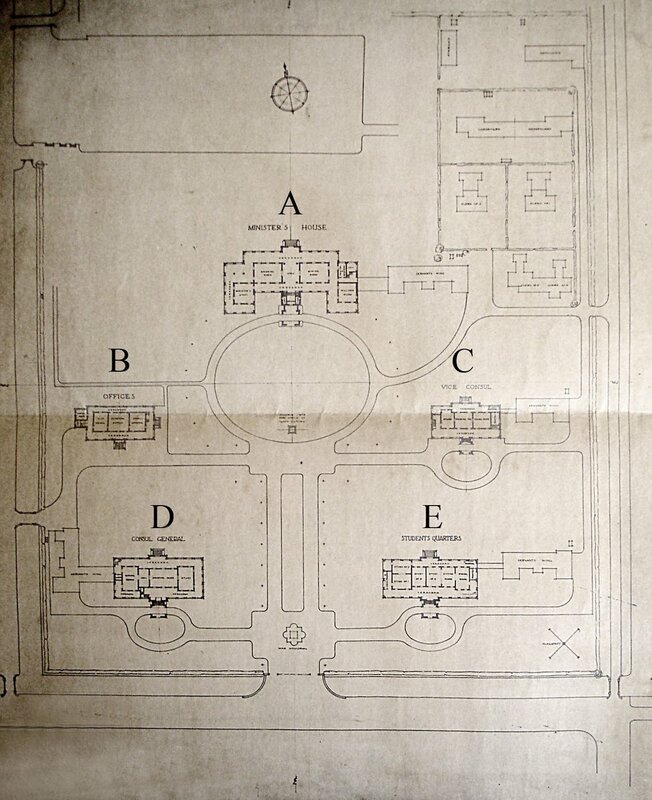 The plans of the five main buildings were relatively easily agreed between Greg and Scott and their foundations were well in hand by August 1924. The main tenders for the superstructures of the buildings were received in November 1924 and the contract was let to Bangkok Dock Company Ltd. the following month. Some cost trimming was required, the most notable change being to lower the eaves of buildings C, D and E by a metre and thereby omitting the ‘frieze’. The ancillary buildings proved more difficult to agree, not least because Greg saw less need of them. Scott explained to London that ‘Mr Greg is naturally not keen on having so many native families close to his own residence … The official servants and their families, who number about seventy altogether, are very well behaved on the whole, but the small babies which arrive at abnormally frequent intervals are apt to be rather noisy.’ The result was that all the servants’ quarters were pushed away from the main axis towards the compound perimeters. Another intrusion that Greg greatly and rightly feared was also resolved. As Scott explained to London in November 1925 ‘From the middle of October to the beginning of December, holiday makers from all parts of Bangkok … visit the pond [Nai Lert’s cistern, next to the minister’s private garden] in motor cars and boats and spend the day bathing and canoe-racing and picnicking on the banks; and on Sundays during this period, from early morning till dusk the pond is crowded with overloaded boats and the banks lined four or more deep with a mob of noisy onlookers.’ Scott added that the pond was on offer for 40,000 ticals. London was anxious not to breach the self-financing principle by exceeding the 1.1 million ticals received from Nai Lert. Fortuitously, however, the need for a Shipping Office down by the river was receding and the part of the former compound that had been retained for it was now sold to an Indian merchant for 50,000 ticals. This was enough to buy from Nai Lert a strip of land, including the pond, 70 metres wide, that lay beyond the entire length of the northern boundary of the new compound. The Treasury gracelessly acquiesced. As well as saving the minister’s residence in perpetuity from noisy crowds on the pond, the additional land provided sites for quarters for clerks, gardeners and messengers. The exact siting of the statue of Queen Victoria, and the vexed question as to whether she should look outwards towards visitors entering through the main gates or inwards towards the minister emerging from his residence, took a long time to agree. She finally arrived at the top end of the straight ceremonial approach, and looked outwards. A huge flagstaff that could be seen from the river was erected at the south-east corner of the compound. Greg was posted to Bucharest before the residence was completed. Back in London, he called on Richard Allison, chief architect at the Office of Works, who recorded that ‘Mr Greg … was somewhat critical on two or 3 points of detail and seemed to be of the opinion that the main house should have been larger’. Another official, present during the call, recorded ‘the impression left on me was that he [Greg] had not been given as many opportunities for expressing his opinion during the progress of the work as he thought proper!’ Greg’s successor, Sidney Waterlow, arrived in Bangkok in July 1926 and was most enthusiastic about the new compound until he had to deal with the clerk of works, Mr Dunn, whom Scott had left in Bangkok to finish the works. Delays of several months in the arrival of furniture from London caused justified dismay (though the punkah over the dining room table was transferred from the former house). To cap it all, the doorway of the legation strongroom was too narrow for the safe from the old compound to be installed. Waterlow finally moved in to the new house in September 1926 and, the following week, praised the new site and the wisdom of moving from the old compound in a long letter to the Foreign Secretary, Austen Chamberlain. The total project fell only fractionally short of its self-financing target. 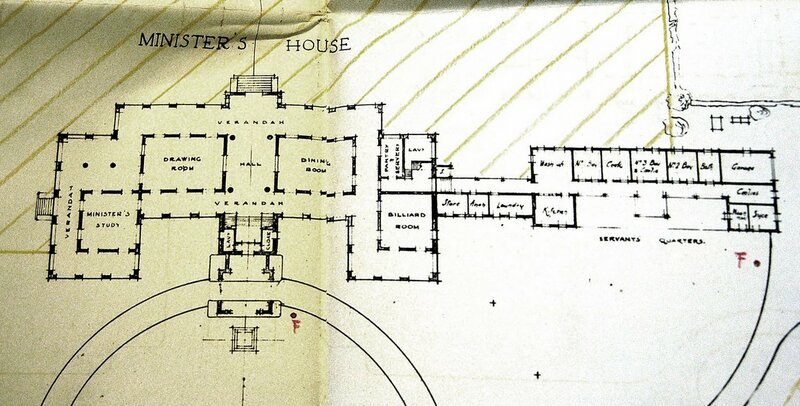 Ground floor plan of minister’s house, 1924. 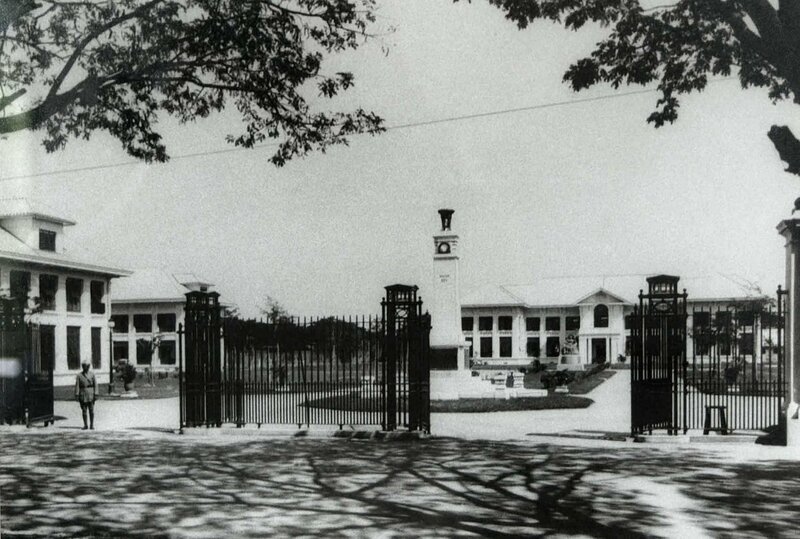 Centre of compound, 1930s, with entrance gates, War Memorial, Queen Victoria, and minister’s residence. 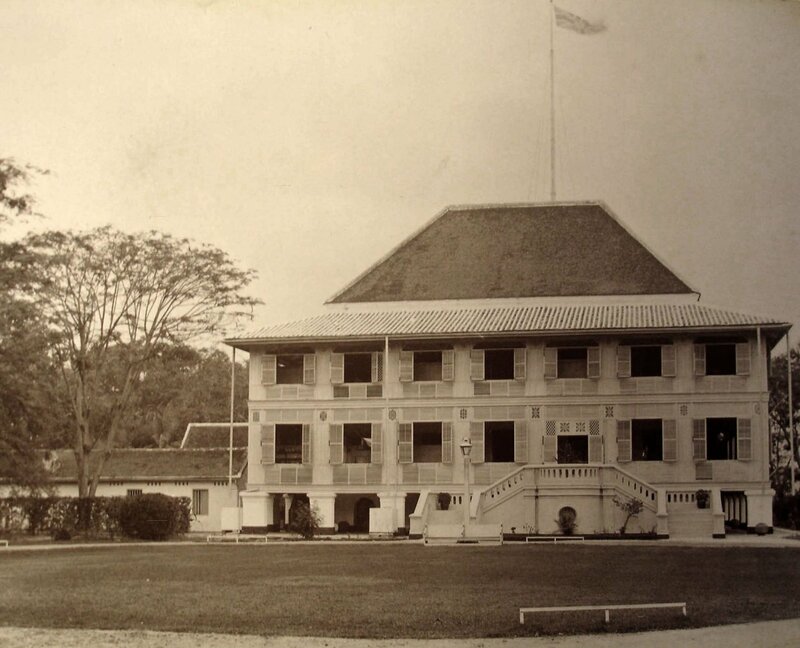 Vice-consul’s house, with corner of residence at left and students’ quarters to right, mid-1920s. 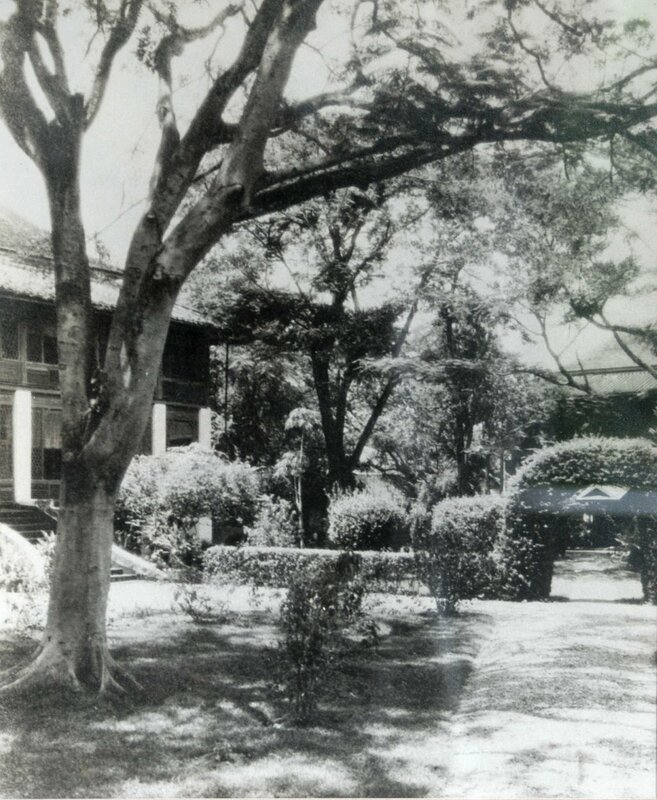 The klong, mid-1920s, with north front of the residence at right and local staff quarters to left. The offices, south front, late 1920s.